This was supposed to be a green smoothie, but when it came time to make it, I was craving blueberries instead. Fruit and almond butter over greens. Go figure. But that’s OK! I’m getting better at listening to my body’s cues. And, when it asks for blueberries, I give it blueberries. 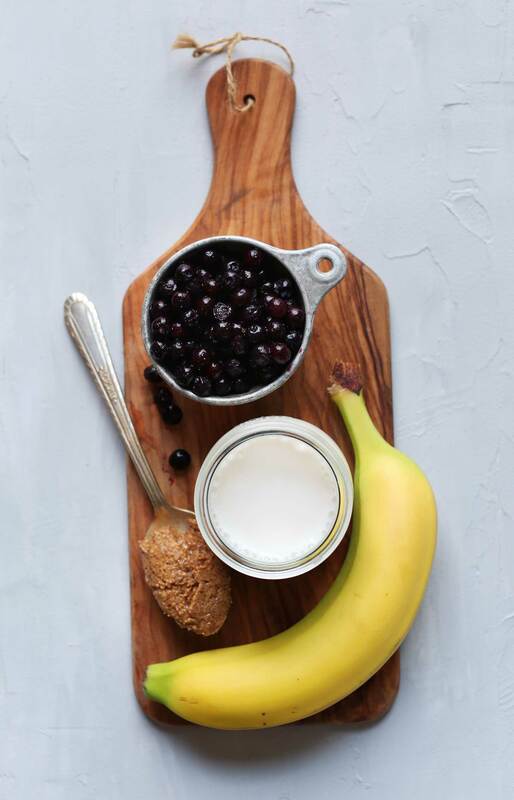 This smoothie requires 6 simple ingredients, a blender, and 5 minutes to make. The base is frozen ripe banana and wild, organic, frozen blueberries (a wintertime favorite of mine). Next comes almond butter for some plant-based protein and creaminess, and almond milk blends everything together. I also added flax and chia seed for plant-based fiber and omega-3 and omega-6 fatty acids. Not only is this smoothie healthy, it’s insanely delicious. 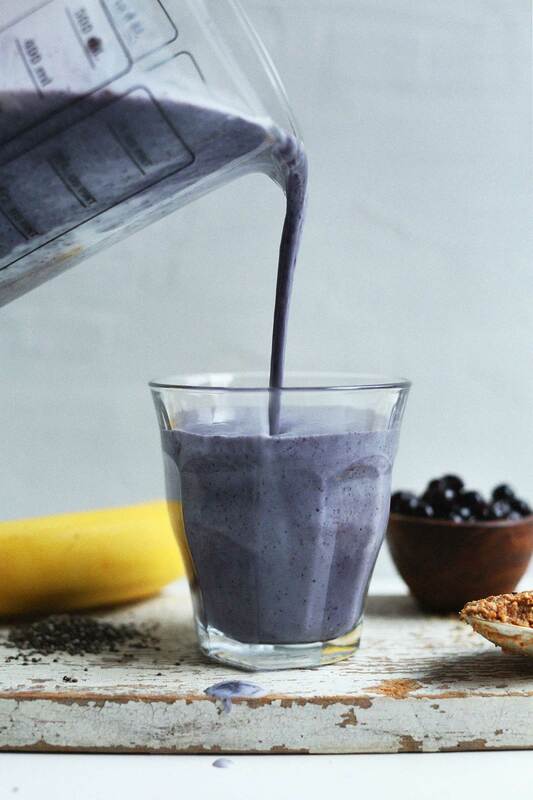 It’s somewhere between a blueberry milkshake and a banana smoothie – my favorite. Trust me, you’re gonna want this smoothie. This would make the perfect, quick weekday breakfast or afternoon snack. It’s even a suitable dessert! I love adding a little coconut milk to my serving glass before pouring on the smoothie for a “swirl” effect. Makes mealtime more fun (and beautiful). Love blueberries? Be sure to try my Blueberry Muffin Breakfast Cookies and Coconut Oil Blueberry Scones with Rosemary! Looking for more smoothie ideas? Check out a few of my other favorites: Ginger Colada Green Smoothie, PB&J Date Smoothie, 5-Ingredient Detox Smoothie, and Carrot Ginger Turmeric Smoothie. If you try this recipe, let us know what you think! Leave a comment, rate it, and don’t forget to tag a photo #minimalistbaker on Instagram! We’d love to see what you come up with. Cheers, friends! 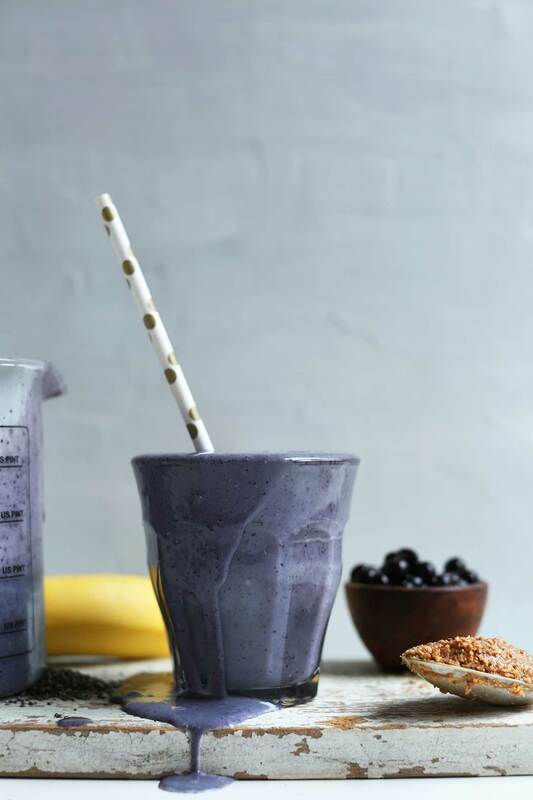 An insanely creamy, nutritious, 6-ingredient smoothie with wild blueberries, banana, almond butter, flaxseed, and chia seed. A delicious, plant-based breakfast or snack! *Nutrition information is a rough estimate calculated without protein powder or additional toppings (i.e. coconut milk or chia seed). Thank you so much for this recipe. I have been having a really hard time finding smoothie recipes that actually taste good and turn out right. I didn’t opt in for the protein and didn’t have frozen bananas or unsweetened almond milk but did have frozen mangos and organic vanilla almond milk, which was delicious. This was also my first time being brave enough to try chia seeds and flax seeds….I’m not very adventurous that way when it comes to the smoothies I usually buy from the local smoothie place. I think from now I will be sure to add them to just about all of my homemade smoothies. Thank you again! Absolutely delicious!! It’s getting very hot here in Minnesota and after working out I didn’t feel like eating much for dinner. This was the perfect post-workout recovery meal! Made with ingredients i always keep on hand, too (everything from Trader Joe’s)! We’re glad you enjoyed this recipe, Melissa! I made this! I uses fresh fruit and omitted the flaxseed and chia. And used unsweetened vanilla almond milk because it’s my favorite. I liked it but added some yogurt to thicken it up and then I loved it. Absolutely delicious! Perfect thickness, smoothness, creaminess, fruitiness, everythingness. Will be making regularly! I love this smoothie. I also tied it with strawberries in place of blueberries…yum! Sounds yummy. I assume the banana is for giving the smoothie thickness. We have a banana allergy in our house. Can something else be substituted?? Enjoying this awesome smoothie after workout! Love your recipes – thank you! Can almond milk be substituted by skim milk here? I made this smoothie for dinner tonight and it was delicious. Thank you, thank you for your wonderful recipes. Delicious as usual. Have made a few times and it’s super easy and tasty. I usually add a handful or two of greens and it’s still perfectly purple and very nice. This was super yummy and I can’t wait to customize it and try throwing in some new ingredients! Decent smoothie. Next time I’ll omit the almond butter though. The mixing of all those fats (chia, flax, almond), gives a heavy and slightly unpleasant taste. What would you recommend to substitute for bananas? Hi! For the same flavor, I am not sure – but here are three smoothies without banana! Such a good recipe! Simple and delicious. I’ve had it 4 times this week…….. I just made this and used peanut butter instead of almond butter because that is what I had. It was delicious. I also added a tablespoon of vegan protein. It was perfect. This is going in my regular everyday smoothie recipes. Thank you so much. I don’t care for breakfast foods. So this is the perfect replacement. I loved the recipe! <3 So creamy and delicious. I leave out the flaxseed and already substituted it with cashew butter and milk, and different berries. So good! My favourite breakfast right now. I LOVE this recipe!! It is one of my favorite smoothie recipes! I even added some spinach to it for added nutrition and protein and couldn’t tell a difference ;) I am so glad found your blog a couple months ago. I have been making and eating way healthier suff! Thanks Dana! I make a very similar smoothie all the time! I use frozen blueberries and add kale and add closer to 2TB almond butter. No bananas for me so i use a tsp of chia seeds to help thicken. It’s really delicious and keeps me full for hours! Hi! If you prefer your smoothies a little less cold, feel free to use fresh fruit! Good luck! Made this this morning! What a tasty ? way to start the day! So delish! It was tasty but I thought the blueberry was slightly overpowered by the banana. Maybe I used crappy blueberries (Costco’s big organic bag) and/or have weird taste buds right now bc I’m preggo, though. OMG this looks fantastic! I make a version of this with peanut butter instead of almond butter and sneak in a big handful of spinach and you can’t even tell! soooo goood! The combo of blueberries and almond butter is just perfect! 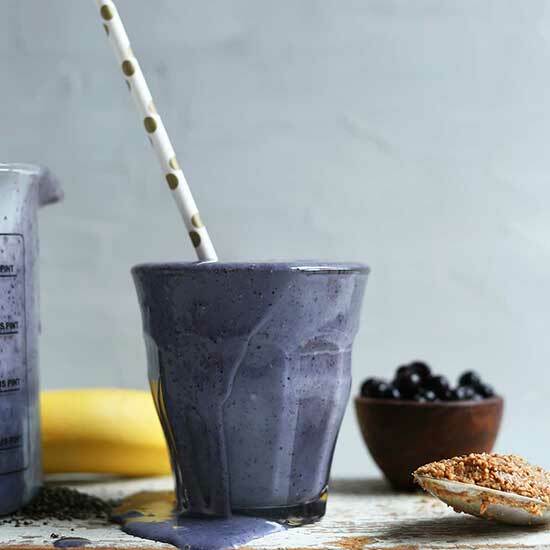 I made a variation of this smoothie this morning and loved it, the blueberries and almonds were the definite stars of the show. I didn’t want any banana flavor so I swapped that out for a chopped up date to still give me some added sweetness and then switched out flax for hemp seeds for a little added protein. I also added in some broccoli sprouts as another reader suggested and used my homemade coconut milk in place of the almond milk. The spirit of my smoothie and inspiration was all found here, so thank you, it was delicious! Made this smoothie this morning. Sometimes banana can over power other flavors but the amount called for is just right. I added frozen spinach which totally disappears. I made the blueberry smoothie yesterday and it was super good! Love the colours in this post, Dana! Love the color of this smoothie!!! Delicious! I made it with Trader Joe’s Mixed Nut butter. A perfect and filling breakfast! 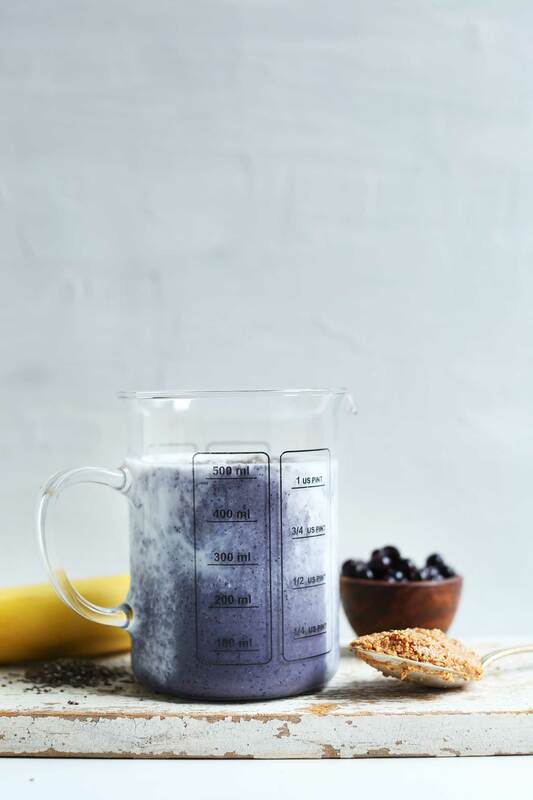 Just made your blueberry peanut butter smoothie and it was excellent. I’m sure this one is as well! And how can you not feel virtuous drinking a blue smoothie? This is my new favorite smoothie recipe! Thank you so much for sharing! Side note: I also tried substituting the blueberries with strawberries and it still turned out great! Cant wait to try this! What is the difference between flaxseed and flaxseed meal? Hi Laura! Flaxseed meal is just ground flaxseed! Thanks for posting this recipe. It sounds wonderful! I tossed all the ingredients (except almond butter, almond milk and protein powder) into a freezer bag tonight. In the morning I’ll pour it into my blender, and the missing ingredients and have breakfast in less than 3 minutes. I love trying out your smoothie recipes! It keeps me from falling into a rut! First, this looks delicious! I am just starting on my minimalism journey and besides physical things, I am also trying to minimize the amount of processed foods that my family consumes. I love that your recipes use fewer and fresh ingredients and don’t take a lot of time. One thing that makes it easy to prepare processed foods is the lack of time it takes. I will definitely be using your site as a resource to simplify ingredients and time in the kitchen. Thank you! I just made this for my whole fam, and this may be our favorite smoothie recipe ever! My husband and both my daughters (3 and 6) said it was perfect! I am the big blueberry craver in this family, and I’m constantly trying to get my girls to eat them, as much as I want to keep the deliciousness to myself in a way. :-) This is going to be one of our favorite breakfasts! I tried this with a little thumb-sized chunk of fresh ginger added–soooo good! Thank you, Dana! You always have something to perk up these gray, northern, winter mornings. I regularly make a very similar smoothie but with blackberries instead of blueberries! For some reason I hate blueberries, but I also add cinnamon, acai powder and cacao nibs and stir in a sugar free cereal for a more “acai bowl” effect. I also find it works best when I use half a frozen banana and half a over ripened banana. I was going to reply that I always add cinnamon to my blueberry smoothies, too! This was so good! I added a bunch of broccoli sprouts and you couldn’t even taste them over the blueberry yumminess! Do you have any smoothie recipes that don’t have banana in them? Sometimes I used steamed, frozen cauliflower in place of bananas in my smoothies to cut back on the sugar. Something you might want to try!